Cognitive Linguistics presents a forum for linguistic research of all kinds on the interaction between language and cognition. The journal focuses on language as an instrument for organizing, processing and conveying information. It is devoted to high-quality research on topics such as: the structural characteristics of natural language categorization (such as prototypicality, cognitive models, metaphor, and imagery); the functional principles of linguistic organization (such as iconicity); the conceptual interface between syntax and semantics; the relationship between language and thought, including matters of universality and language specificity; and the experiential background of language-in-use, including the cultural background, the discourse context, and the psychological environment of linguistic performance. 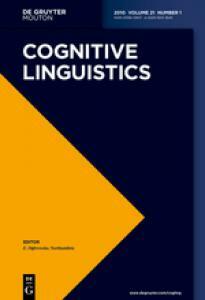 Cognitive Linguistics is a double-blind peer-reviewed journal. The Editor-in-Chief of the journal is Dagmar Divjak, School of Languages and Cultures, University of Sheffield. Contact: cogling AT degruyter DOT com. The Outgoing Editor-in-Chief of the journal is John Newman, Department of Linguistics, University of Alberta, Canada & School of Languages, Monash University Clayton, Australia. Contact: cogling AT ualberta DOT ca. For more information, including guidelines for submitting papers to the journal, you can visit the website of De Gruyter (www DOT degruyter DOT com/view/j/cogl).